Kamela received her master’s degree in occupational therapy from the University of North Dakota. 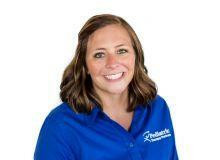 She has experience working in inpatient adult transitional care, outpatient mental health, and pediatrics. Kamela is passionate about helping all children, especially with sensory integration and developmental delays. She is certified in Herman and Wallace Pediatric Incontinence and Pelvic Floor Dysfunction, and has additional training in sensory integration, and treating children with behaviors due to trauma.